A different take on the typical survival story because it includes a falcon! Thirteen-year-old Karma is lost in the backcountry of Montana with her falcon, Stark, and a troubled runaway boy named Cooper. She’s desperate to find help for her dad and brother after a blown tire on a back road causes a terrible accident. Karma wouldn’t be in this predicament if her parents hadn’t insisted on returning Stark to the bird’s original owner. Life at her father's bird sanctuary—and Karma’s dreams of becoming an apprentice falconer—will never be the same when she has to give Stark back. Lost in the wild, their bond only grows stronger as Karma teaches the falcon to hunt like a bird of prey. All the while, Cooper gets his own lessons on how to trust in newfound friendship. Both Karma’s and Cooper's mettle is tested by mountain terrain, wild animals, severe weather, injury, and her own waning hope as this edge-of-your-seat wilderness adventure story vividly portrays the special bonds that can form between humans and animals. 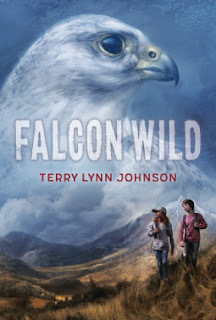 Falcon Wild was written by Terry Lynn Johnson and published by Charlesbridge in 2017. It’s an exciting adventure story as well as a story of friendship between Karma and Cooper. One of the things I enjoy about middle grade novels are all the unique hobbies and interests kids have. The details about falconry in this book were super interesting! The setting is a big part of this story, so it’s a good book to read to study to see how to integrate setting details. I liked how the main character in this story made several “mistakes” and had to find ways to resolve her feelings about them. I really enjoyed Terry Lynn Johnston’s novel Ice Dogs and I’m looking forward to reading her other new stand alone novel, Sled Dogs. She is also writing a Survivor Diaries Series and the first book, Overboard! is now available. There’s a teacher’s guide for this novel here. I've really enjoyed the books of Terry's that I've read. This setting sounds really interesting. And great quotes that you picked out. I've always loved survival type stories and this one sounds great. Thanks for sharing and being a part of MMGM this week. Wow, a middle grade book about falconry. That is so cool.